In dispensing with footage of the interviewer asking the questions, the director wisely concentrated on presenting only the answers, doing so with brevity that makes each word count. The youths speak on camera with calm honesty that gives the film an aura of intimacy and, therefore, emotional authenticity. There are no canned or rehearsed answers, but quiet, genuine reflections about life and death (too much of it!) by those who are growing up in some of the most dangerous neighborhoods in America. 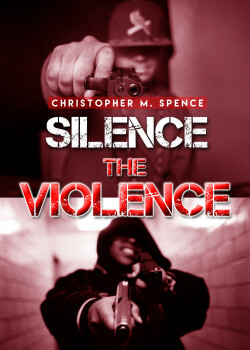 The unique achievement of Silence the Violence is the scope of facts and issues it covers in a short duration. The film dramatizes the ways violence is rooted in multiple factors: the easy availability of guns, the pressure on youths to join gangs, the various causes of individual armed conflicts, the ruinous effects of aggressive police tactics, harassment and needless shootings, the reality of community-police disconnect and distrust (and some programs that aspire to heal it), the tragedy of poor parenting (or the complete lack of it), the prevalence of illegal drug use and drug dealers, the shortage of school funding and lack of afterschool programs to keep kids off the street (coupled with overuse of suspension and expulsion of at-risk students, rather than addressing the underlying issues of troubled background, abuse and neglect), and the heartbreaking hopelessness and dismal prospects, especially for African American males. Silence the Violence excels particularly in its efficient use of visual data slides and striking footage of actual street (and police) violence, which are edited to complement (yet not overwhelm) the rich spectrum of personal feelings shared by the interviewees. The film achieves a high level of emotional authenticity and intellectual veracity, and thus transcends the common pitfall of heavy-handed moral preaching. In fact, Silence the Violence speaks to the viewer’s humanity, rather than politics or ideology. It is a rare achievement, especially in today’s heightened political polarization and ideological divisiveness, and is therefore worthy of our strong commendation and unequivocal endorsement. In summary, this is an invaluable documentary for anyone interested in understanding inner-city violence, comprehending the pain and suffering it produces, and taking part in the grossly-overdue national effort to address the fundamental causes, heal the deep wounds, and literally ‘Silence the Violence.’ An excellent film—highly recommended!